Each summer for four years now I have spent a fair amount of time at the Palisade Glacier. That zone is, hands down, my favorite place to climb mountains. I love the Palisades. I have also made a career of managing risk in the mountains. All mountains present inherent risk to their visitors. The peaks and routes of the Palisade Glacier area are no exception. We will never, thankfully, remove that risk from our pursuits. The risk, the unknown, the cliche'd "adventure of it all", is a huge part of why we go. That being said, none of us are psyched to charge out blindly into risky environments. We do our homework, accumulate skills and collect appropriate gear, all to stack the odds in our favor. Given sound preparation, there are still times and situations where risk is considerably higher than others. Dangerous situations that can be easily managed or avoided are a great arena in which to considerably reduce one's overall exposure. I believe that the way in which the bulk of suitors approach the Palisade Glacier is one of these types of hazards. With a little new knowledge, and by taking what is arguably a more efficient path, a great deal of risk can be eliminated. First, the status quo. For a variety of reasons, of those that approach the Palisade Glacier (and its climbing routes that start between Glacier Notch and Thunderbolt's East Prow) the greatest percentage approach via the Glacier Trail and "Gayley Camp". Getting to Gayley Camp is fine. There is a "trail" of sorts and a short section (~100 yards) of talus boulder hopping. Gayley Camp has water nearby and flat sandy spots for a number of tents. However, getting from Gayley Camp to the Glacier in summer conditions, whether traversing to Glacier Notch or descending to the Glacier surface is, in my opinion, miserable and overly dangerous. Allow me to elaborate. First of all, it is between .1 and .5 miles of large boulder-hopping. Second of all, most climbers to traverse this section have reported those same large boulders moving under body weight. Let us forget for now the annoyance of talus and moraine travel. After all, that is often unavoidable in the mountains, right? One might suggest that shifting talus and moraine is an unavoidable reality also. That would be a mostly valid assertion. However, I wish to make the case that this particular chunk of mountain terrain is far more prone to unstable stacked rocks. This article assumes at least the reader's rough familiarity with the region, and continued overall retreat of the Palisade Glacier. The article at this link summarizes fairly well a rough outline of the Sierra's largest glacier and it's behavior. Another concept that is fundamental to understanding my forthcoming theory is the idea of talus formation and "angle of repose". In short, a talus slope in the mountains is formed when rocks fall, singly or in larger events, from a steep cliff and accumulate on lesser-angled terrain below. The accumulation of rocks at the base of that cliff, due to the initial and dramatic settling of those rocks and the ongoing and subtle forces of frost-action, reaches and maintains an equilibrium in overall slope angle and stability of individual rocks. Of course, some of those individual rocks will wobble in place a little bit. However, lacking a significant disruption, talus slopes are remarkably stable. This link gives further information on talus and "mass-wasting". I would like to propose that the "retreat" of the Palisade Glacier is providing a significant destabilizing force to this particular talus slope. Read on. The pair of pictures below show a far over-simplified "cross-section" of that area. Imagine our viewing location is somewhere beyond the toe of the glacier and we're looking east-southeast with x-ray vision. The process of destabilization that I am suggesting an explanation for here is far from a step-by-step process. The drawings below merely represent two theoretical snapshots in time. However, I think they make my point. Historical situation. Palisade Glacier surface height at "equilibrium". Rocks fall from Mt. Gayley, come to rest and reach their angle of repose with the lower support coming from glacial ice. If you buy into all this, and are concerned, what's left to do? Fear not, there is an alternative. I can say on good authority that the alternative approach offers little to no compromise in terms of efficiency. Done properly, the alternative summer approach involves a little more off-trail travel but even less rock hopping than the Gayley slope approach. What rock-hopping there is (worst-case scenario -when it is completely dry- there is about 200 yards that is mandatory) comes mainly after the high-camp and is of average stability. This approach is a trail-less chunk of beautiful and varied alpine terrain. Route-finding is not difficult and the vegetation is fragile. Anywhere you would want to camp there are plenty of flat sandy spots already all buffed out. This route, marked in red on the map below, does not need cairns or a trail. Enjoy! 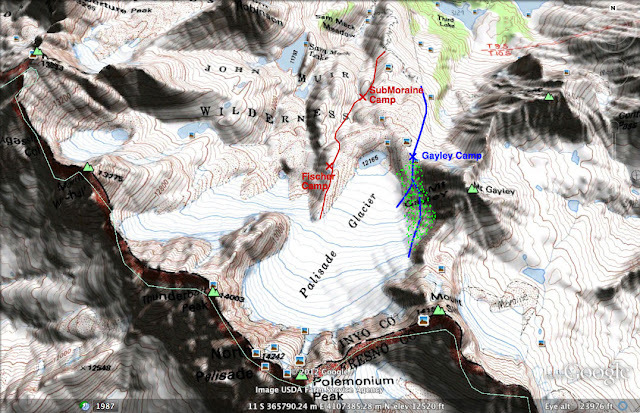 Blue represents the "traditional" (or, at least, more common) approach to the Palisade Glacier. Red is an alternative summer approach. Green dots represent talus, moraine and rock-hopping, much of it unstable and ready to move underneath body weight. Don't "Aron Ralston" yourself! A few disclaimers: All this applies in the summer, under predominantly dry conditions. All this is exaggerated in drought years and less problematic in big snow years. Ideal approaches and campsites will vary in winter and through the transitional spring and fall seasons. The entire content of this article is merely my personal opinion, not endorsed by my employers or the Forest Service or anyone else. My first trip along the red line marked above relied on information gleaned from the late, great John Fischer. John used the campsite we have now informally named after him as a less-crowded alternative to Gayley Camp. Nothing is ever new. Jed - great insight. I can vouch that the slope below Galey is a major hazard. I wonder what the water situation is at Fischer? There's water there. 2 tarns show up on the maps (and in a photo on my F.B.). Often they're under snow/frozen solid, but in that case there are drips below the snow. Again, in the summer. Spring and fall, things may be different. That's right, this was your mystery tarn with the crest in the background. Gracias, Senor. Well postulated, Jed. From my brief college studies of glacial geomorphology, and subsequently intermittent observations over the years, I think there may be some other factors at play as well. I think you are correct that the slope is slowly steepening as the glacier recedes and drops. This would help explain why the rocks are becoming more unstable, but would conflict with your theory about how the rocks got there - mass wasting from the cliffs above. Repeated rockfall would generally have a reverse effect, making the slope less steep versus more. A lateral moraine-like feature called a protalus rampart will often form in areas of frequent rockfall onto slopes that marks the deposition terminus then subsequent rockfall gets blocked by this ridge and the slope starts to flatten out over time. In addition, talus fields/slopes do not only form from mass wasting events. 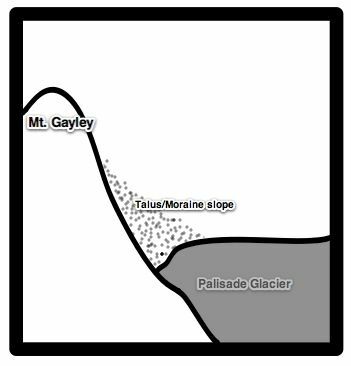 In the case of the Palisades you can find many square kms of talus fields that make access to the glacier difficult (and make the point of your article relevant). These talus fields result from a combination of mass wasting and glacial plucking that produce rocks that are crushed and eventually deposited by the glacier as moraine. You will notice that moraines are often very unstable. This is because the glacier slowly and gently leaves these rocks stacked upon themselves as in the game of Jenga. On slopes these boulders frequently shift under the factors of gravity, snowmelt, and because on many terminal and surficial moraines there is ice underneath that creeps, moves, and melts. This never allows the rocks to settle and stabilize. In this case we have a steep slope (near the angle of repose as you mention) that is moving underneath and getting steeper. This makes it terribly unstable. Older moraines, especially with no ice underneath tend to be more stable than newer ones and flatter moraines are also more stable, all factors being equal. You may be able to think of some talus fields in the mountains that are quite stable. These may be older moraine features, or likely they were the product of larger mass wasting events. The base of Cardinal Pinnacle is a good example of how massive rockfall can create more stable talus. This is because of the forces involved that produce rapid settlement of the strata. That all said, great observation that the Eastern side of the Palisade Glacier is treacherous and irritating at best. Good call to consider Fischer Camp instead in early season, or if you are prepared to melt for water late in the season. I also think it is more aesthetic and certainly gets better morning sun. A great suggestion. I also like the Thunderbolt glacier terminus in spring and very early summer before the moraine melts out, perhaps my favorite camp and easiest to access.